The basis of the fitness boards can be turned into a stretching board. Alternatively, it can be used as a footrest at my desk. 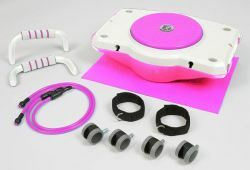 Easy to store, due to small parts are stored in the Fitness Board. MF board is a multi-use training tool that provides all users in any fitness level to experiences an effective training. All on the one piece of equipment allows you to easily target a number of different physical systems in the body. Locked design, it doesn't occupy the space and easy for storing the parts.